Top Franchise Lawyers in Gilbert, Arizona, at Denton Peterson, P.C. Buying a franchise is one way many people choose to get into business rather than starting their own business from square one. Franchise owners don’t have to come up with the winning idea and business plan on their own — they just need to manage the franchise properly according to the franchisor’s requirements. There are many pros and cons to buying a franchise and starting your own business. A Gilbert franchise and business lawyer can discuss these pros and cons with you. Franchising your business is a sign for many that you’ve made it — you’ve built a successful business concept that you can share with others that they can replicate. However, franchising your business is not a simple process and requires compliance with federal and state franchise rules. It is important to have an experienced franchise attorney help you through the process. Whether you are a franchisor or a franchisee or are just considering a franchise, the laws surrounding the franchise relationship are complex. It is important that you work with an experienced Gilbert franchise lawyer to protect your interests and minimize your liability. The attorneys at Denton Peterson, P.C. are ready to help. If you decide to start franchising your business, an experienced franchise attorney at Denton Peterson can assist you through the process. Choosing the right structure for your proposed franchise and then preparing the proper Franchise Disclosure Document are some of the most important first steps for starting your franchise. There are strict rules regarding the Franchise Disclosure Document that you will need to be aware of. You cannot sell a franchise until the Franchise Disclosure Document is properly prepared for prospective franchisees. During our initial meeting with franchisors, we ask our clients to fill out an extensive questionnaire and we have an in-depth discussion to understand your goals for franchising your business and how you want to structure your business. Our attorneys will help you understand the pros and cons of each franchise type, such as unit franchises, area representation franchises or other franchise models. We also discuss other important information regarding the franchise including franchise fees, royalty fees, advertising, term of the franchise relationship, franchise territory, trademarks, and financial disclosures. Once you have determined the right direction for your company, we work on drawing up the Franchise Disclosure Document to get your new business opportunity started on the right foot. The Franchise Disclosure Document or FDD is a lengthy document in which franchisor provides specific information about the offered franchise as required by federal law. The FDD and associated documents will ensure you are meeting your legal requirements, and it will give potential franchisees the information they need to make a decision about your company. The document also includes exhibits with sample franchise agreements, financial statements, and other information. Additionally, the FDD must also be updated to reflect any changes in the business. We help clients update their FDD as needed. In addition to the federal franchise rules, some states impose additional requirements on franchisors including registration before franchisor can begin selling its franchise in that state. If you plan on selling franchises in any of these registration states, you will need to register your franchise in each of those states. The rules vary in each state, so it is important to understand each state’s requirements. We help clients file the registration application with the appropriate state agency to ensure that the paperwork meets all of the state requirements. Registrations must be renewed each year in the states in which you intend to continue to offer franchises for sale. It is important to talk to a franchise attorney about where you plan on selling your franchise in order to make sure your franchise is ready for sale in that state. The process varies between states and it can take from a couple of weeks to several months to register the franchise in some states. If you will sell your franchise in a registration state, you will want to make sure you have adequate time for the registration process before you plan on offering your franchise for sale. 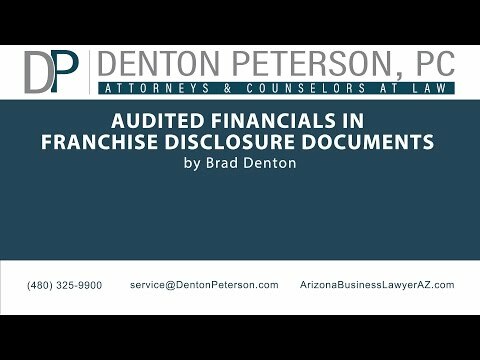 Audited Financials in Franchise Disclosure Documents | Denton Peterson, P.C. We also keep track of the important deadlines and renewal requirements and let clients know when those are imminent. That way, our clients can meet these requirements while also focusing their energy and time on growing their business. Their counsel is extraordinarily valuable! We will definitely use them in the future! If you are thinking about purchasing a franchise, you will want to have an attorney review the Franchise Disclosure Document. It is important to carefully review the FDD in order to understand your obligations as a franchisee and the obligations of the franchisor. An experienced franchise attorney can review the FDD and provide guidance as to what concerns there might be in the FDD and how you can negotiate with the franchisor. 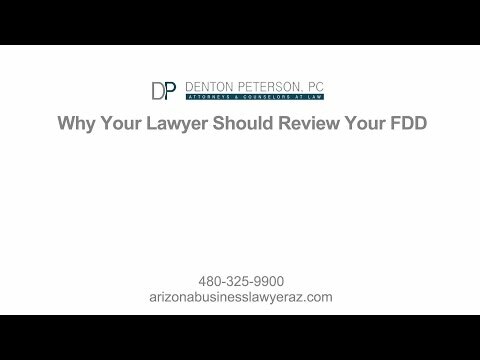 The attorneys at Denton Peterson have reviewed the FDDs from numerous franchise concepts, provided analysis of the FDD to our clients, and have assisted clients in negotiating with the franchisor. …and much more. We are a small firm with a lot of experience, which means that our attorneys form close working relationships with our clients and are able to give them sound legal counsel on a variety of issues related to franchising. Our goal is to help you reach your franchise goals (as a franchisor or franchisee) while also protecting your legal interests. We have experience representing both franchisees and franchisors in various stages of the franchise relationship. Call us today to learn how an experienced Gilbert franchise lawyer can help you with your franchise needs.